If one man at Ibrox has been a bit of a forgotten figure this season it’s been the unfortunate Jamie Murphy. A decent signing from Brighton last January year under Graeme Murty, Murphy’s permanent recruitment which followed in the summer was regarded as a solid piece of business albeit not one admittedly to set the heather alight. A fine player, competent and assured, Murphy wasn’t exactly an exciting winger but he was a pretty reliable one, and often played on the left to cut in with his favoured foot – after a slowish start to life under Steven Gerrard he started to look far more the part he had under Graeme Murty, with a few good performances in the Europa League especially. But then that fateful day on Killie’s lethal turf wrecked his season and even to this day we still don’t know if Murphy will manage to be fit in time to get a few minutes before this season draws to a close. The question is is does Murphy have much of a role to play under Steven Gerrard next season? The former Motherwell man has the unfortunate bad luck of being in the very position Gerrard has populated with abundance in. The likes of Grezda, Kent, Candeias, Middleton et al provide extremely healthy competition at worst for Murphy, and complete lack of opportunities at worst. There is another of our Ibrox Noise nagging feelings that the past season passed him by not only physically but hierarchically. Is he yesterday’s man? It’s possible. Gerrard did use him fairly regularly before his injury, so perhaps the manager sees him as very much still part of his plans, but aged 29 there’s little doubt Murphy’s best days are behind him and psychologically his ACLI will have affected him. Few players come back from an ACL half of the player they were before. 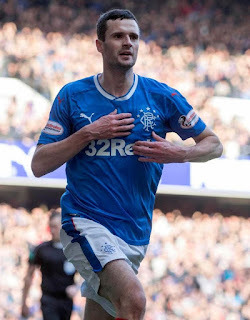 And worse for Murphy is Stevie’s recruitment of Jordan Jones, who’s regarded as a serious first-choice for the left side, especially if Ryan Kent’s continued stay at Ibrox can’t be secured. Which leaves Murphy in a curious position. If Kent leaves, Jones will be first choice and Middleton and Murphy will vie for the bench. If he stays, Kent and Jones will compete and both the deputies will seriously struggle. Either way, Murphy’s future is certainly one that’s very much up in the air. I never understood that injury. To my best knowledge, they said the astro 'gripped' his stud. Now if that was the case, it's obviously way too long. I chipped in with a comment last year, that if Killie and Liv WON'T change these pitches, we hould petition the SFA to be allowed to play on these pitches, in something like an Adidas Samba. A flat-soled trainer. Which would end this type of injury in Scotland, for good. It never went down to well. But I thought it was a good idea and if adopted, would see an end to injuries like these. I am not expert enough to know, but could he play No 10, in the hole. Or roaming behind a striker? That would give Arfield support/competition and free up money for somewhere else. I hope we Keep Him and I hope he comes back blazing!